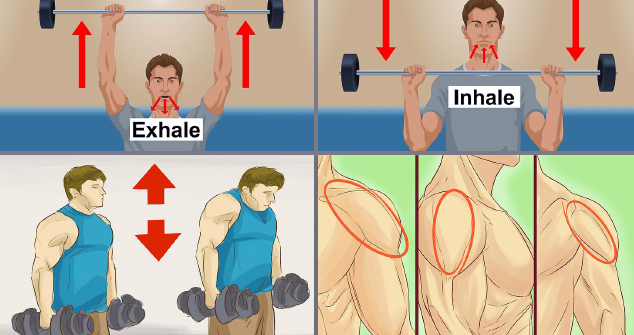 Home Workouts 7 Best Shoulder Exercises You Need To Start Right Now! 7 Best Shoulder Exercises You Need To Start Right Now! Stand next to a fixed bar grabbing it with one of your hands. Take the dumbbell in your other hand. Holding your feet together lean to the side holding your dumbbell until the arm holding the fixed bar is fully extended. Once in this position start raising the dumbbell up in the same manner as the dumbbell side raise. This is a multi-joint exercise and we recommend doing it at the end of your workout. Stick to 8-12 reps per set. By isolating the side deltoid, this exercise involves a much wider range of motion compared with the lateral dumbbell raise. Although many people think that the kick-backs primarily target the triceps, this is only true when you bend your elbow. On the contrary, keeping your arm straight will allow a greater transfer of the strain to rear deltoids. Stand in a bent position and grab the pulley. Start pulling backwards, but remember not to bend your arm in the elbow. The key factor of this exercise is maintaining a strict from. If you twist your body in order to get the weight go further then you are not recruiting your shoulders to their fullest. We recommend performing this exercise as a finisher, because you don’t need heavy weights for working the rear deltoids. Although many people choose to do the bent-over dumbbell flyes with cables, research has shown that this is not optimal for isolating the rear deltoids. The reason for this is that when you use the cables, you have to grip them in a neutral way. If you really want to hit the deltoids we recommend using dumbbells with offset grip. Once again it’s crucial that you maintain your form and avoid swinging the weights. This will only reduce the strain you put on the deltoids. This exercise is ideal finisher for the back days.